This morning I woke up from one of my many recurring Harry Potter dreams. Now for most people, this might sound like a really fun dream to have–flying, playing Quidditch, exploring the secret passages of Hogwarts: but not so, my friends. Not so! Harry Potter dreams are my version of stress dreams. Yes, read that one again. Harry Potter dreams are my mind’s freaking sadistic version of stress dreams. ….How messed up is that, right?? It’s about as fair as locking a puppy in a room with a fully-grown Blast-Ended Skrewt, in my professionally nerdy opinion. I’m a pretty vivid dreamer as it is, so when I have a HP dream and all my neurosensors are firing like crazy automatics in my sleeping subconscious, I remember the dreams really well. Sometimes, I am Neville Longbottom in the fifth book and am being chased by a bunch of Death Eaters who laugh maniacally whenever I try to cast a spell (presumably I have a nosebleed like Neville does in the book, so instead of saying Stupefy! and stunning my enemies, I say Stoobefy and am absolutely useless). This morning, however, was the first day of classes with my brand new composition students. Unlike the classes I’ve taught in the past, I’m not a TA for this one: the curriculum is entirely my own, which means that the fates of 20 young, impressionable minds are completely, absolutely in my hands! Muahahahahaha. But uh, back to this dream. The dream itself, typed out, sounds pretty lame–but let me assure you that it was actually really stressful. It started with a very important letter: it had to do with stopping an evil plot and probably something sinisterly Voldemorty. However, I really needed this letter delivered to one of my friends, and all the while the time until the start of class was rapidly ticking away. And then I woke up, freaked out for a second that I had actually missed class, groped around for my wand (did not find one), and then realized I had dreamed everything up and fell promptly back asleep until 10 AM. I blame it all on my delayed Hogwarts acceptance letter; I am 99% sure it’s having a ball messing with my subconscious. Then again, I am also the girl whose other recurring stress dream is just anything that involves my childhood best friend. Any time she appears in my dreams (like, any time–even if it’s a neutral or a good dream), I know that I’m really, really stressed out. I have yet to figure out how that one works. Any psychoanalysts out there? Anyone? The only good thing to come out of this whole event was waking up to this breakfast, which is a very good idea when you’re prone to stress dreams of terrible taste like I am and have very little to look forward to in the morning after. Thankfully, I had had the forethought to shake together a jar of this Apple Pie Overnight Oats and shove it in the fridge before going to bed, so I was well-fed before going to teach my class. And guess what? It wasn’t the best first lesson ever, but at least nothing went up in flames today! I don’t know if it was the Harry Potter, or the oats, or what. Applesauce, Greek yogurt, vanilla soy milk, cinnamon, oats, and–as Taylor would say–Shake it off, shake it off! These oats: they’re more than a brekkie. They’re an attitude. I’m sharing this oats recipe with the rest of the #FoodieExtravaganza group today as part of January’s Oatmeal month. Check out the rest of their delightful oat recipes below–and don’t forget to enter for a chance to win a fabulous oatmeal cookbook giveaway! Throw it all in the night before and--presto! Instant breakfast that will delight and wow! 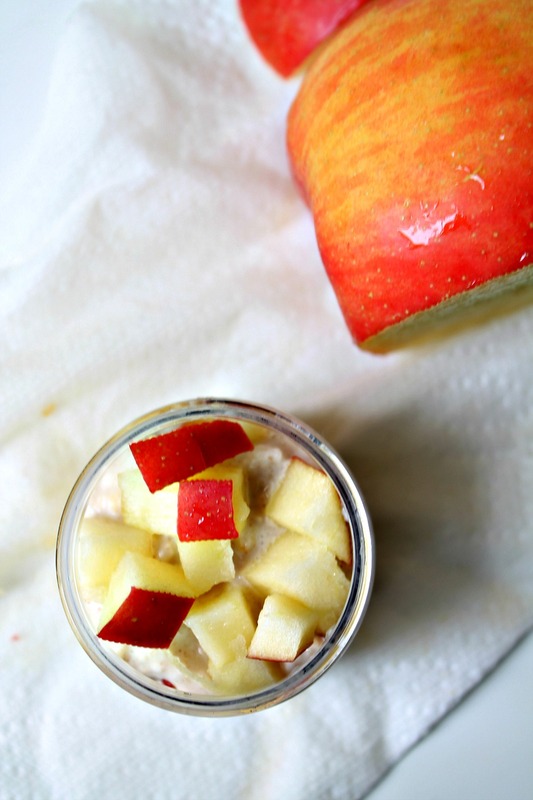 These overnight oats soak up great cinnamony, apple flavors, making it taste just like a (healthified) apple pie. In a small jar with tight-fitting lid, combine all ingredients and secure the lid. Shake well until all ingredients are combined, then store in fridge overnight (or at least 4 hours). Open, take a spoon to it, and enjoy! We are a group of bloggers who love to blog about food! Each month we will decide on an all-famous National Monthly Food Holiday in which we will base our recipes around. This month’s the ingredient is oatmeal. Yes, January is National Oatmeal Month along with a whole array of other delightful things!! Get excited!! We hope you all enjoy our delicious oatmeal treats this month and come back to see what we bring for you next month. If you are a blogger and would like to join our group and blog along with us, come join our Facebook page Foodie Extravaganza. We would love to have you! If you’re a spectator looking for delicious tid-bits check out our Foodie Extravaganza Pinterest Board! Looking for our previous parties? Check them out HERE. Terms & Conditions: This giveaway is open to residents of the United States and Canada only, age 18 and older. The OATragous Oatmeals Cookbook giveaway runs from Wednesday, January 7, 2015 12:00am ET through Thursday, January 15, 2015 12:00am ET. Winners will be randomly chosen and announced on January 16, 2015. Winners will also be contacted by email and will have 24 hours to respond to the email. If a winner does not respond in that time a new winner will be chosen. For more information, see the full terms and conditions in the Rafflecopter widget. What a lovely breakfast to wake up to Ala, hope it helped you feel better from your dream. I’ve never tried overnight oats before, I think going to plan and do it at the weekend perhaps, it looks to good not to try. Oh, it did Laura, thank you! It really makes everything better, I’ve had loads of random dreams lately and I should have made some last night since I knew I’d have a difficult sleep before classes. Anyway, lesson learned–I hope you make lots of it, cheers! I am sure that the acceptance letter just got lost in the mail. In the meantime this recipe is a great way to comfort yourself while awaiting it’s arrival. Aww, that really is exactly what I needed to hear. I’m sure I’ll be getting a direct apology from Hogwarts, too–thank you, Wendy! Happy Wednesday evening! Who doesn’t want pie for breakfast? And this is such a healthy, and delish!, way to do it. Good stuff — thanks. Aw, of course! I’m progressing to handheld pie crusts next, you know. Happy new year, John!! Ugh I detest a bad dream like that and it will make my day goes miserable, lol. Glad you manage to put everything back in its place, especially this overnight oats. I’m a huge fan of rolled oats – from sweet to savory, I love them all. I add them to breakfast smoothies, granola bar, omelette, muffins, basically anything I can think of. Aww, sorry to hear that, Linda! The funny thing is, I can have terrible dream nights and still have a great day–conversely, great dreams do not always mean great days. Last night, I barely slept a wink and had the most restless dreams (because it was a night before teaching–you think I’d have gotten over it by now, but it happens!) and yet we had just an outstanding class. Anyway, now we do know at least one failproof solution. Oats really are a cure-all–I’m off to make something fun with them now! T.R., it’s so good to hear from you again–happy 2015!! You’d fall head over heels in love with this recipe, pinkies. And oatmeal cookies have been sending me in crazy recipe testing mode all month long, so I know we’re on the exact same wavelength. Have yourself a very merry new year, and I can’t wait to share this one with you! Well I did make it. I have to add a table spoon of brown sugar in the morning for my sweet tooth. It ended up being a godsend. I ended up being late for work and just put the jar and a spoon in my lunch sack and away we went. I ended up eating it out in the hallway. LOL. I was soo glad it stopped me from binging on something that would not have done my body good. And it kept me going until lunch. I felt really good about it. It probably won’t be my go too only because I realize I really love hot oatmeal (and cream of wheat and grits). But for a good breakfast and I know I’m going to be hitting the ground running I can definitely put this together and still feel healthy. Awww, this comment just made my day, T.R.–as you usually do when you stop by and I get to read your lovely thoughts! I’m so honored you picked this recipe to try first, and I really hope it keeps you running through the rest of this awesome year. I totally get the hot oatmeal cravings as well, but hey–for those late days, right? I’m so, so glad, and I’m smiling like crazy right now. Thank you, T.R., and wishing you an awesome year! LOL. How funny that you actually had a narrator in your dream! As a very vivid dreamer and huge HP fan, I’m actually pretty disappointed in myself that I’ve never had a Harry Potter dream. I can imagine it’s probably terrifying to have deatheaters chasing after you when it feels real, though. 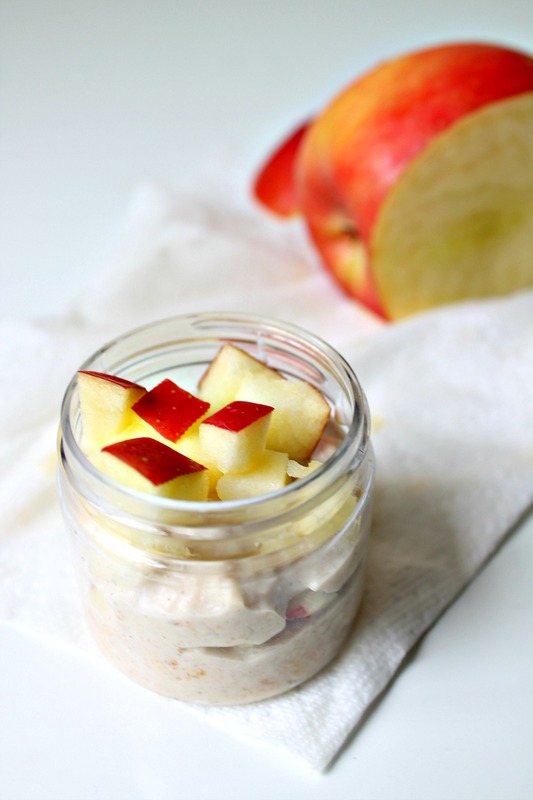 Anyway, I love the idea of apple pie overnight oats! We had a kick of doing overnight oats everyday for quite some time, but it’s been a while. I think it’s time I bring it back! I like you already, Joy! Any HP fan is a friend 😉 I’m actually not exaggerating at all when I say that these overnight oats saved me post-Death Eater dreams, and on more than one occasion. You should totally go for the phase again, I think it’s time to revive it (kind of like bellbottoms and oversized shades, right? No? Too soon?). If you ever do have the HP dream experience, I hope it’s a positive one! It’s so lovely to meet you, Joy–cheers! Love the idea of waking up and breakfast is made. We’re on the exact same wavelength, LeAnn–cheers, and happy Thursday!! Overnight oats makes for a wonderful way to begin the day, breakfast is done! My favorite way to enjoy oats is in cookies. Chocolate chip, apricot oat, oatmeal raisin… I can’t think of a cookie with oatmeal that I don’t like! I love crockpot Pumpkin Spice Oatmeal. Oh YUM, Holly, now you’re talking! Cheers to that idea! My two very favorite oat edibles–I’d raise a glass to that! That sounds like a very stressful dream indeed! I am guessing it has something to do with that first class if, like me, you can’t help feeling unprepared, even if you are well prepared, when you are newly in charge of something. That sassy apple pie oatmeal with attitude is a great start to a successful day, Ala! Well done! I love the simplicity of this! I should totally do this for breakfast at work! Yummy! Dawwww thank you, girl! Stress dreams could be worse, I suppose I shouldn’t complain 😉 a good brekkie with you would snap me out of it, I know that!! Hehe! Whoa, I think an HP dream with Voldemort would be a stressful dream for me too. I’m so impressed you remember your dreams so vividly though. 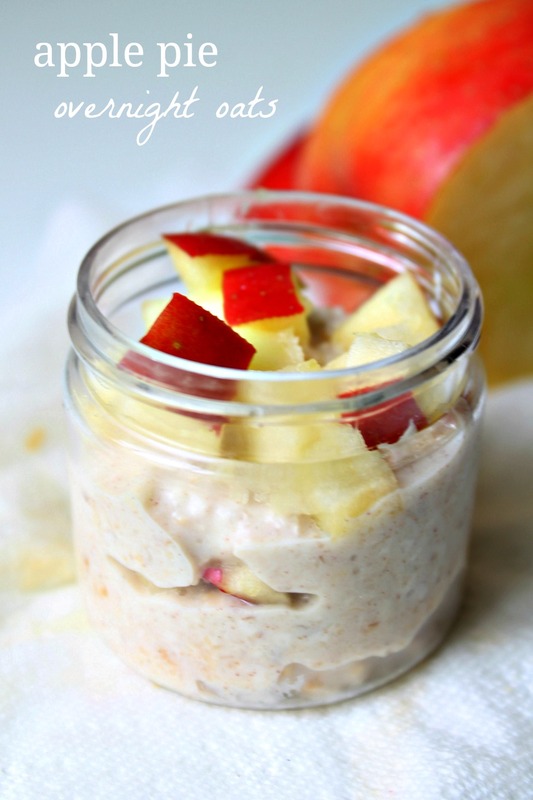 Glad you were able to wake up to a jar of these overnight oats! 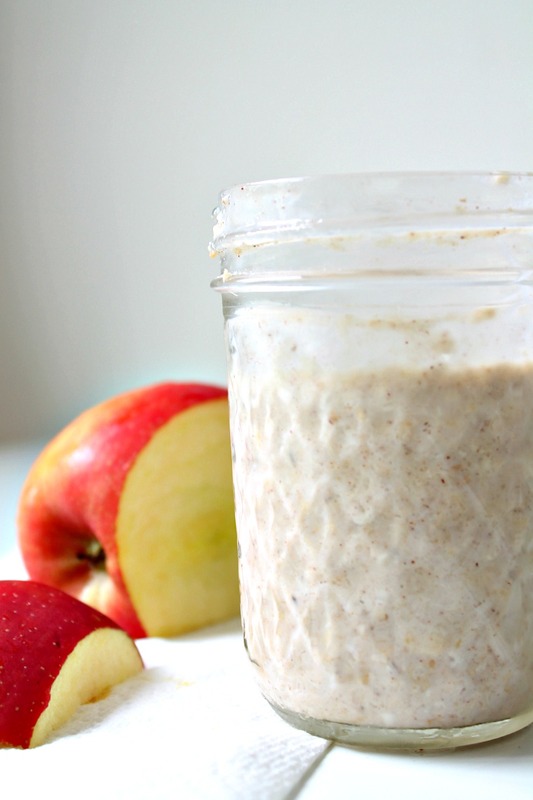 Oats of any kind are my favorite and now I’m totally craving for this apple pie version! Ohh, I could go on ALL day about the sorts of crazy dreams I have, Kelly! Cheers to us both being oats fans 🙂 you’re pretty lucky you don’t have too many dreams disrupting your sleep, I’m sure! Ooh, I’d love these flavors of oats and apples in the morning (especially since I cannot justify eating pie!). I’m so glad your day went well—and hope your stress dreams stay at bay the rest of the semester! I’m still waiting on my Hogwarts acceptance letter as well, but I don’t have very vivid dreams hiding around in my subconscious. 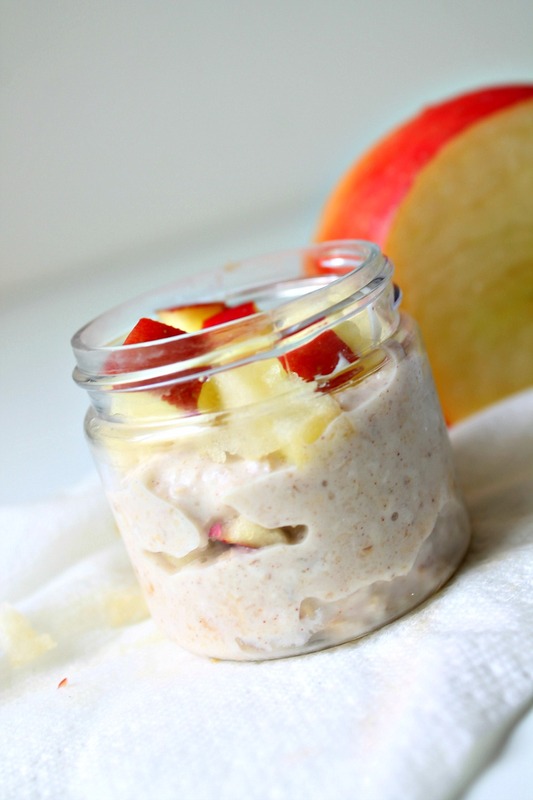 I love overnight oats, and these sound amazing, breakfast already ready to go? Definitely a good feeling to have in the morning. Most people have earthquake or emergency kits…me? I have an emergency Hogwarts trunk. Robes and my wand and all that jazz. Not true, but you know, I’m pretty close….heh. Have yourself a great week, Jacklyn–it’s so nice to meet you here!! cheers! I love overnight breakfast recipes.. means I don’t have to think about making a delicious breakfast when I’m still tired in the morning. 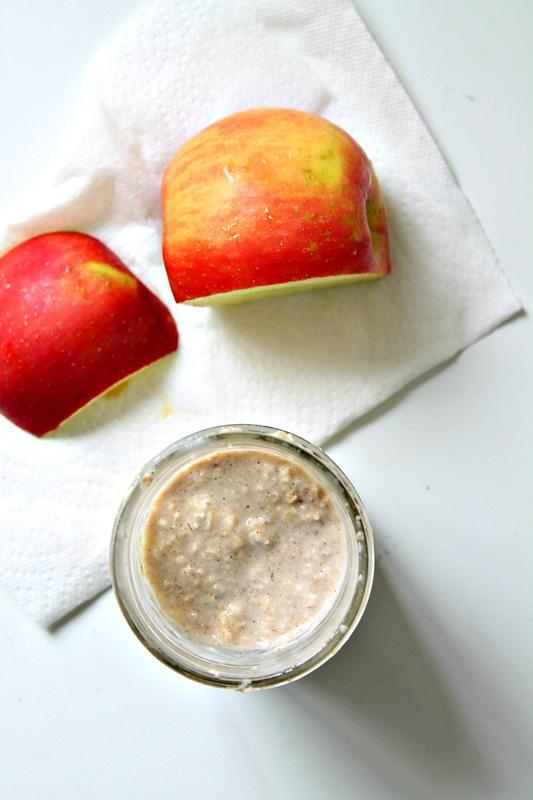 I have to make these apple pie flavoured oats, they look and sound so delicious! Yesss, Thalia, I am so on board with you on this one! Have yourself a very merry overnight-brekkie kind of week! I think you are my new favorite person. Can we please be best friends on a mission to find our missing Hogwarts letters!? P.S. – The oats sound good, too. 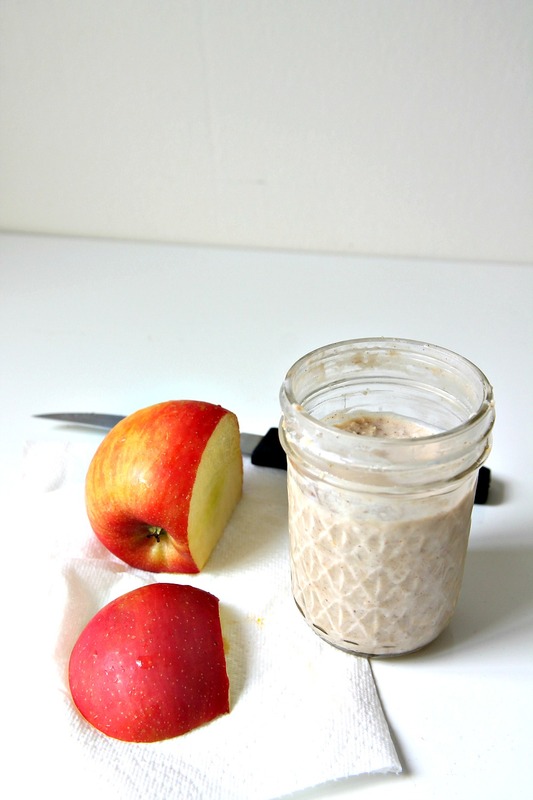 Applesauce + Oatmeal is pretty smart! I have yet to jump on the overnight oats bandwagon, but I think your version is going to push me over the edge, Ala! I’m not sure it could get an easier … even if you had some sort of Harry Potter spell to do so! I have night terrors sometimes and have actually ended up in the hospital from getting hurt during one before. Bad dreams are horrible. I’m sorry you get stress dreams. I’m not a fan of oatmeal, but yours sounds like something I would like.